The wood-constructed Akakura Hotel Korakuso resembles a classic resort style mountain villa with a stylish and classical atmosphere. Guests find it easy to relax and enjoy the view of the Myoko mountain ranges. The starkness of these in winter can remind you of an ink brush painting. It is just 2 minutes’ walk from Akakura Onsen Ski Resort and Korakuso offers Japanese-style rooms with plenty of natural light. 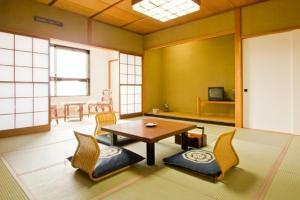 The pleasant rooms are air-conditoned and have fine wood furnishings and tatami mat flooring. They come with a TV and a private bathroom with heated shower facilities. 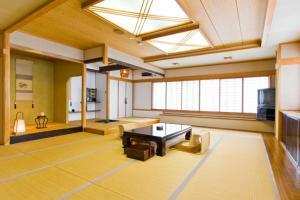 The hotel includes a large indoor onsen, an on-site bar to relax and enjoy a drink, gift shop and lounge area. It is recommended that you try the ramen at the hotel’s ramen bar – arguably the best ramen in Akakura village. The Korakuso is a 10-minute walk from Okakura Tenshin Rokkakudo. It is a 5-minute drive from beautiful Imori-ike Pond and 8 minutes’ drive from JR Myoko Kogen Train Station. Guests can browse through the gift shop or take a stroll through the greenery surrounding the property. Added conveniences include free parking and free Wi-Fi in public areas. 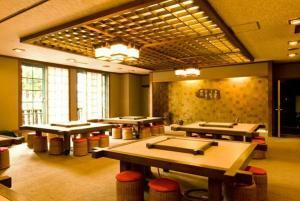 Japanese meals are served for breakfast and dinner at the Taihei Classic Dining Room and Sanyo Dining Room. The hotel has several lounge areas for relaxation. ﻿ Book Korakuso Hotel now!